TextUS.biz's Receptionist app works on a simple principle: Most businesses, even larger businesses, no longer employ fulltime receptionists to sit at the front desk waiting for someone to walk into the office. Whether you work in small, shared, collaborative workspaces, a mid-sized business, or even a larger enterprises it's quite likely you're looking for a simple way of connecting with your clients, vendors, and delivery people when they arrive at the front desk. Receptionist makes iPad-based front desk reception almost human. Receptionist is a puzzle in two pieces. 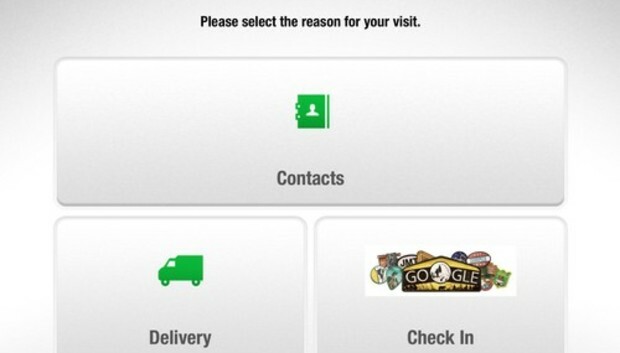 The first is a free iPad app called Receptionist the second is a TextUS.biz Receptionist account. The former provides the touch screen interface your clients use to announce their arrival, the latter provides the backend data that drives what your clients see. Receptionist accounts, after an initial free 30-day trial, range in price from $49 per month for up to 24 contacts, unlimited messages, and visitor logging on one iPad to $249 per month for all of the above with 100 or more contacts and multiple iPads. All administration is done using the TextUs.Biz website and the Receptionist administration interface. When you first log into the site you're walked through a setup process where you can add your company logo or an introductory text message, set an audio prompt message that's played when clients check in and choose how you want to log check-in information for your clients. Receptionist's logs can capture images of your clients as they check in, which can be viewed later. Receptionist offers three default button options: Contacts, Deliver, and Checkout and you also have the option of creating custom buttons. Contacts displays a searchable list of people your clients alert to their arrival. Contacts can be added manually or imported from a CSV file the includes the contact's first and last names, a unique mobile number for each contact, and an email address. Once created, these contacts can be added to custom or Contacts button and as someone who should be notified when deliveries arrive. For the Delivery button, Receptionist comes with a pre-defined selection of six delivery companies, four of which can be selected for the delivery screen. You can select from three messages for deliveries or create a delivery message of your own. Once all the basic setup (which includes entering your billing information) is complete you publish your data so it's a available from the Receptionist iPad app. This app is designed to be used as a kiosk device that your clients use to check in. When they arrive--and depending on how you've decided to set the app--your clients will either see a list of contacts or the buttons you've defined. After selecting a contact, they enter their name and a company name and sign in. If they're from a delivery company they choose their delivery company and select one of the messages you've defined. In either case, once they're checked in, a message is immediately sent via SMS and email to the selected contact and the guest is told that the contact has been made aware of their arrival. Upon receiving the message via SMS or email the contact can respond via SMS or predefined email message and the Receptionist app will display the contact's response on the iPad's screen. At check in the Receptionist app keeps log info on who has checked in and captures an image of the client if you've set the app up to do so. Overall I found Receptionist to be an excellent option for reception-less offices, although I did find that going back to change settings, add or remove buttons, or update client information was a bit kludgy. When you're logged into the Receptionist admin site there is no obvious option for changing settings. Instead you have to walk through the same setup process you used when initially creating an account and setting the app up. I found Receptionist's logging capabilities to be quite good although, because you only have an option for exporting data in a CSV format, it's not possible to export the images captured when clients check in. TextUs.biz's Receptionist app offers an excellent alternative for receiving clients into your business and notifying your employees of their arrival. While I'd like to see better tools for exporting log data and updating configuration information, as a point of contact tool it does an amazing job. If you're working in a receptionist-free office, Receptionist will more than fill your needs.